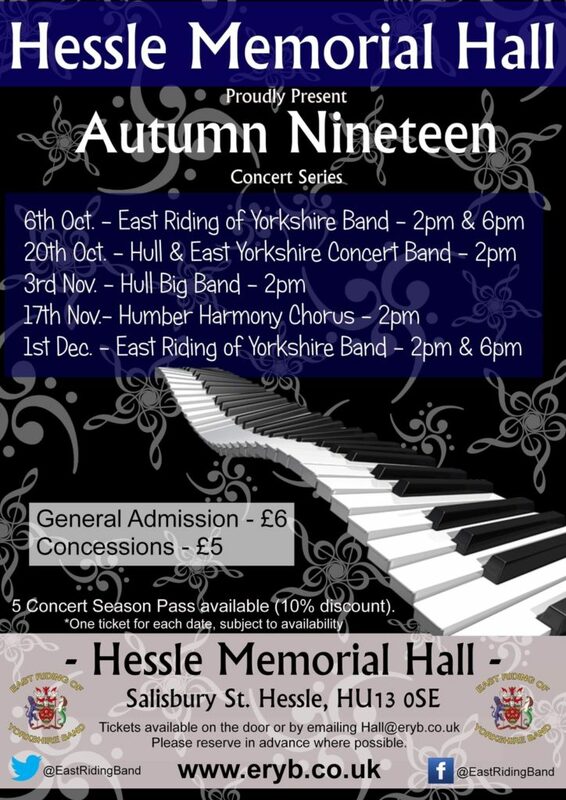 Book your tickets for the Autumn Nineteen Concert Series at Hessle Memorial Hall. 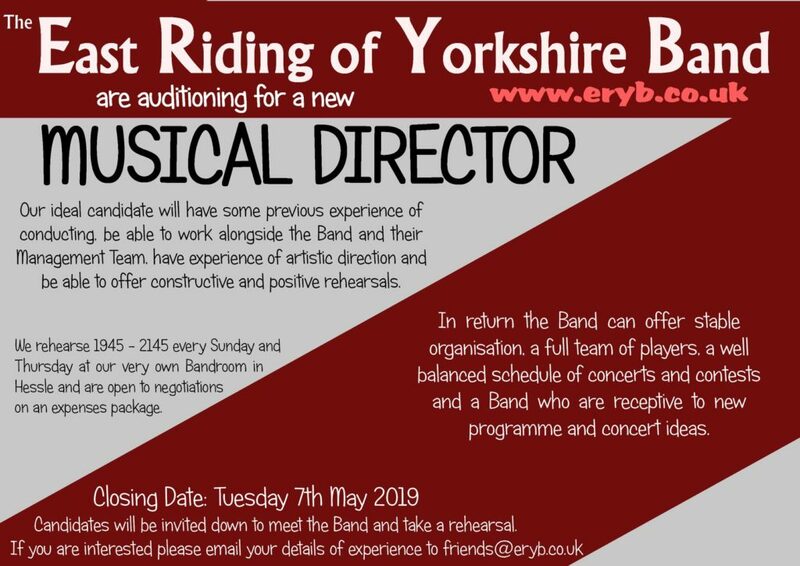 The East Riding of Yorkshire Band would like to welcome expressions of interest to fill the vacancy of Musical Director. Please email friends@eryb.co.uk with your details if you are interested in applying, closing date is Tuesday 7th May 2019. 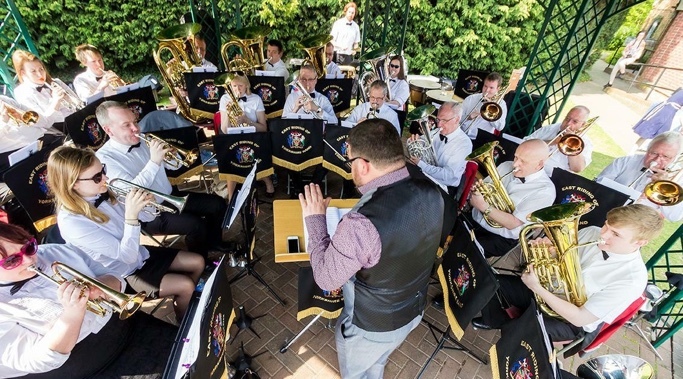 The East Riding of Yorkshire Band is a Brass Band situated in East Yorkshire but with players from all over the East Riding of Yorkshire and beyond. We currently rehearse at our own band room in Hessle, which is located at 1 Salisbury Street, Hessle, HU13 0SE on a Sunday and a Thursday evening between 7.45-9.45pm. We are always looking for additional experienced players, please get in touch if you can help. The Band play at many events around the area, including indoor and outdoor concerts, events and shows. We are available for engagements at any location in the East Riding and surrounding area, if you wish to enquire or book the band please contact us. The band is available to play at your concert or event. See where we are playing next. Help the band and receive patron privileges. Success for ERYB at Regional Finals! Band finishes the Summer with a flourish! The East Riding of Yorkshire Band (Musical Director, Ian Scott) are looking for a Front Row Cornet player. We are a friendly and enthusiastic 3rd Section Band and rehearse in Hull. If you are interested in the above position, please contact in confidence:- Mike Kerridge by email: ekimmort@hotmail.com. Telephone 07989 470776. The Band are pleased to announce that we have appointed Ian Scott to be our new musical director, we look forward to working with Ian and welcome him to the band. Welcome to the webpage of the East Riding of Yorkshire Brass Band, please have a look round at our upcoming concerts, and get in touch if you would like more details, or if you are a player looking for a band. The Easy Fundraising website donates money to causes in return for people going via their website when online shopping. There are over 2700 registered retailers who will donate a percentage of the amount you spend to East Riding of Yorkshire Band to say thank you for shopping with them. 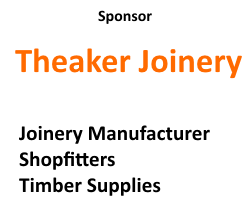 Just click on the logo above to get started, thank you for your help. The 100 Club is a monthly draw which gives members and supporters of the East Riding of Yorkshire Band the opportunity to win one of two cash prizes every month. For more details download the flyer, you can pay by cheque or by bank transfer ask us for details. Click on the map to get an interactive version. © East Riding of Yorkshire Band. All Rights Reserved.